In the study of ancient affairs, folklore and tradition throw an invaluable light on historical records. In Greek mythology we read of the great Ethiopian king, Cepheus, whose fame was so great that he and his family were immortalized in the stars. 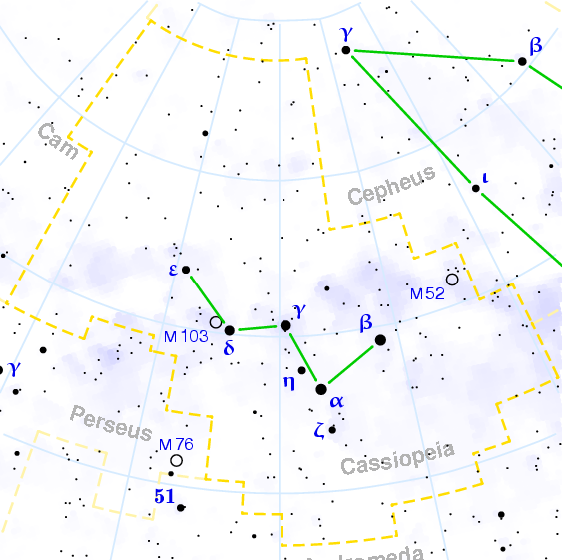 The wife of King Cepheus was Queen Cassiopeia, and his daughter, Princess Andromeda. The star groups of the celestial sphere, which are named after them are called the ROYAL FAMILY (the constellations: CEPHEUS, CASSIOPEIA and ANDROMEDA.) It may seem strange that legendary rulers of ancient Ethiopia should still have their names graven on our star maps, but the voice of history gives us a clue. Should it be asked at what epoch this system took its birth, we shall answer on the testimony of the monuments of astronomy itself, that its principles appear with certainty to have been established about seventeen thousand years ago, and if it be asked to what people it is to be attributed, we shall answer that the same monuments, supported by unanimous traditions, attribute it to the first tribes of Egypt; and reason finds in that country all the circumstances which could lead to such a system; when it finds there a zone of sky, bordering on the tropic, equally free from the rains of the equator and the fogs of the north; when it finds there a central point of the sphere of the ancients, a salubrious climate, a great but manageable river, a soil fertile without art or labor, inundated without morbid exhalations, and placed between two seas which communicate with the richest countries; it conceives that the inhabitant of the Nile, addicted to agriculture from the facility of communications, to astronomy from the state of his sky, always open to observation, must have been the first to pass from the savage to the social state; and consequently to attain the physical and moral sciences necessary to civilized life. It was, then, on the borders of the upper Nile, among a black race of men, that was organized the complicated system of the worship of the stars, considered in relation to the productions of the earth and the labors of agriculture. Thus the Ethiopian of Thebes named stars of inundation, or Aquarius, those stars under which the Nile began to overflow; stars of the ox or bull, those under which they began to plow, stars of the lion, those under which that animal, driven from the desert by thirst, appeared on the banks of the Nile; stars of the sheaf, or of the harvest virgin, those of the reaping season; stars of the lamb, stars of the two kids, those under which these precious animals were brought forth. Thus the same Ethiopian having observed that the return of the inundation always corresponded with the rising of a beautiful star which appeared towards the source of the Nile, and seemed to warn the husbandman against the coming waters, he compared this action to that of the animal who, by his barking, gives notice of danger, and he called this star the dog, the barker (Sirius). In the same manner he named the stars of the crab, those where the sun, having arrived at the tropic, retreated by a slow retrograde motion like the crab of Cancer. He named stars of the wild goat, or Capricorn, those where the sun, having reached the highest point in his annuary tract, imitates the goat, who delights to climb to the summit of the rocks. He named stars of the balance, or Libra, those where the days and nights being equal, seemed in equilibrium, like that instrument; and stars of the scorpion, those where certain periodical winds bring vapors, burning like the venom of the scorpion. 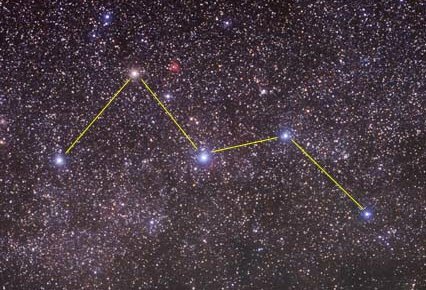 Cassiopeia is a northern constellation which Greek mythology considered to represent the vain queen Cassiopeia who boasted about her unrivaled beauty. It is one of the 88 modern constellations, and was also one of the 48 listed by Ptolemy. Cassiopeia, the mother of Andromeda and wife of King Cepheus of Ethiopia, thought she and her daughter were the two fairest that ever lived. In fact, she foolishly claimed that Andromeda was so beautiful that even the sea nymphs (Nereids) could not surpass her beauty. Hera, Zeus’ jealous wife, and the Nereids themselves, overheard this. Furious at Cassiopeia’s boasting, they visited Poseidon (the sea god) and demanded an immediate punishment. Poseidon sent the sea monster Tiamat (represented by Cetus) to attack King Cepheus’ realm. With his kingdom in the gravest danger, Cepheus consulted an oracle for advice. He learned the only way to save Ethiopia involved the sacrifice of Andromeda to the raging sea monster. Heavy hearted and bitter over his wife’s vanity, the king was forced by his people to comply. Poor Andromeda was dragged to a ragged part of the coast and was told of her fate. She was stripped naked and chained to a large rock to await her grisly fate. The monster soon arrived. Tiamat was about to eat her, when the monster felt a sharp pain in his back. He turned and found Perseus flying with winged sandals and attacking him. The monster grew stronger as they fought. Then Perseus remembered that he was carrying Medusa’s head. All who looked at it would turn to stone. He dropped his sword and took out the creepy object. The sea monster stared at it and turned immediately into stone. Andromeda watched the whole incident (except Medusa’s head), and smiled with a sigh of relief. Perseus fell in love with the beautiful Andromeda and carried her home to marry her. The gods made constellations for each of them, but felt Cassiopeia had gotten off too easy. They punished her by condemning her to circle Polaris forever in her throne. So even now, she alternately sits right side up and hangs upside down in the heavens.